Pixel Film Studios, FCPX Plugin Developer announced the release of a new effect called ProSidebar Christmas. This Final Cut Pro X Plugin is perfect for the holidays. 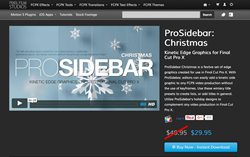 ProSidebar Christmas is a festive set of edge graphics created for use in Final Cut Pro X. With ProSidebar, editors can easily add a kinetic side graphic to any FCPX video production without the use of keyframes. Users can use these wintery title presets to create lists, or add titles in general. Utilize ProSidebar's holiday designs to complement any video production in Final Cut Pro X.
ProSidebar Christmas includes 30 self-animating title presets. Users can drag a title preset above any media in the FCPX timeline and ProSidebar will instantly add a festive graphic to any video production. Choose from presets with snowflake elements, ribbons and beautiful text styles. ProSidebar Christmas includes various animation options for the sidebar and text. Choose from fading, scaling, and moving text animations using intuitive drop-down menus found in the inspector window. Alter the snowflakes, particles, and colors with simplistic controls. Pixel Film Studios makes titles functional and easy-to-use for FCPX editors. ProSidebar Christmas makes creating beautiful lists easy with built-in customizable nodes. Choose from a variety of shapes and shape outlines using a drop-down menu. Customize the color, width, scale, count, and spread of nodes with intuitive controls. Create lists with up to 20 items with ProSidebars title presets. Editors can add a drop shadow to create greater depth between the sidebar and the scene below. Users can colorize, blur, add distance, and rotate the drop shadow with simple controls in the Final Cut Pro X inspector window. Instantly add a kinetic edge graphic with drag and drop ease.